You are here: Home / Blog / 9 Amazing Travel Hacks for Families! 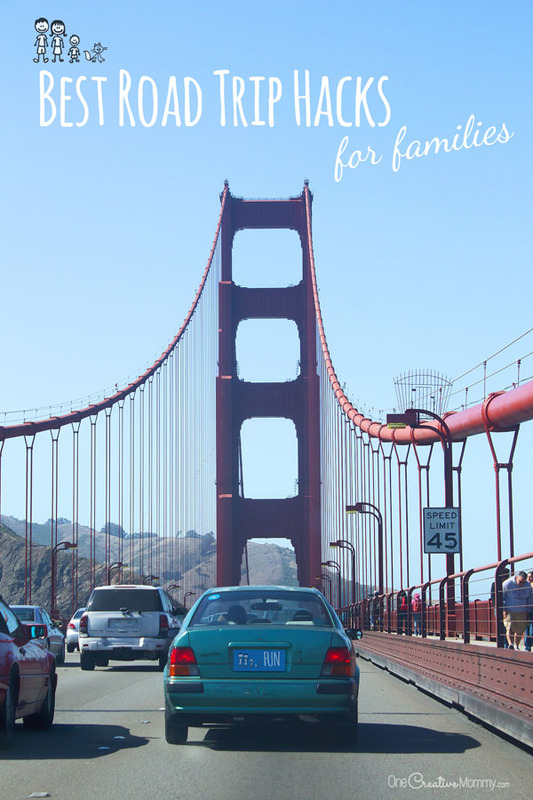 9 Amazing Travel Hacks for Families! We’re getting ready to take a huge road trip this summer. We’re headed almost from coast to coast — in the van — with three kids. Crazy? Maybe, but we think it’s going to be great. To get ready, I’ve been collecting travel hacks — great ideas to help make road trips with kids just a little bit easier. Honestly, a lot of these tips are brilliant whether you have kids or not! Here we go! I use this tip all year long — not just for long trips. The bowl is always open, so the kids can easily toss things inside. I stash it under the center console in my van. That’s not the reason I use it, though. When’s the last time you heard, “Mom, I think I’m going to throw up!” as you were driving down the freeway with no chance of stopping? Not to gross anyone out, but a garbage bowl can become a throw up bowl in seconds. 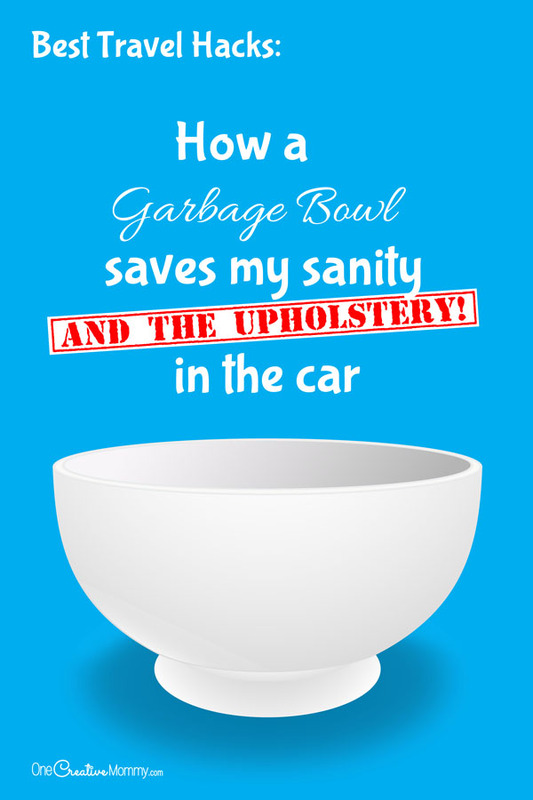 Simply dump the bowl anywhere in the car. (I don’t let the kids toss wet garbage in the bowl.) Now pass the bowl back to your child before they spew all over themselves, their siblings, and the car. It’s easy to clean up the dumped out garbage. Not so easy to clean up vomit. Seems like a silly hack, but trust me. It’s worth it. The garbage bowl has done it’s extra job in our van more than once, and I’ve been very grateful to have it! On this trip long trip, in addition to the bowl, we plan to be extra safe with some hospital grade vomit bags from Amazon. Hopefully, we won’t have to use any of them! Here’s to healthy travelers! Keep zip-lock snack bags and small paper or plastic cups in the glove box for snacks. It’s great to travel with snacks already portioned in baggies for the kids, but that’s not always practical. When you pop open that giant bag of M&Ms to share with the family, pull out the ziplock bags, fill them up, and pass them out. But what about the driver? Keeping track of and opening a little baggie can be distracting. That’s where the cup comes in handy. Stick the cup in the nearest cup holder and fill it up with a snack. The cup stays open and stays put. The snack is accessible to the driver, and the driver is not distracted. Perfect! If you have little kids in car seats, passing things back and forth from the front to the very back of the van can get old very fast. 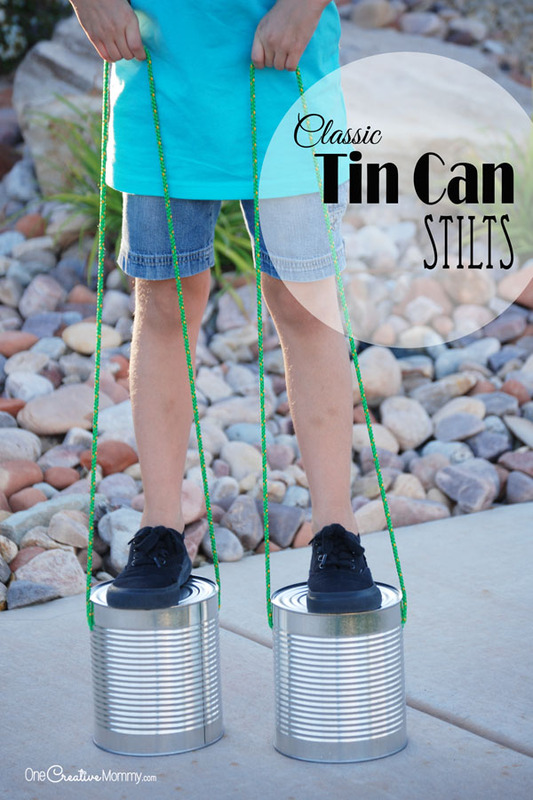 Try this fun Buckets and Car Pulley System from Kids Activities Blog. I have big kids, but I still think this looks fun. I personally get car sick when I have to turn around a lot while I’m in the car. This hack would be perfect for me! Keep the things you will not need while driving in the least accessible areas. Keep the important stuff where you can get to it. 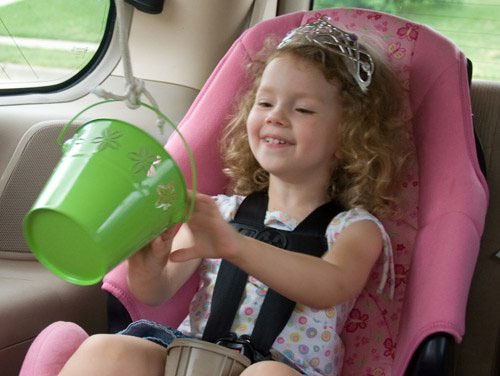 If you are using a car topper, keep a small bag with a change of clothes (or pajamas for the kids, if you are traveling close to bedtime) for everyone inside the car. Accidents happen. (Spilled drinks, too long between bathroom breaks, sick kids, kid slipping in the mud at a rest stop, etc.) Nobody wants to to have to unpack the whole car to get to a fresh set of clothes! Speaking of car spills. Have you ever had a kid squeeze a juice box too hard and squirt themselves and their surroundings with sticky juice? When our kids were little, we solved that problem with juice box holders. Loved them! Ours didn’t have handles (which was a little more big-kid friendly), but I’m sure the ones with handles work great, too. They usually work for juice boxes and juice pouches. Even better — just travel with water bottles. We have found that we make fewer bathroom stops when the kids drink water instead of juice or soda. When they only have water, they only drink when they are thirsty. So what’s that picture above? That’s a Stayhold Cargo Companion. If you travel with lots of stuff that tends to tip over and fall out, use these to keep things in place. Cool! Most people start off on a road trip with a clean and organized car. As time passes, things get unpacked and moved around (see tip #4), and messes happen. It unavoidable. Keep on top of the messes to keep life happier in the car. I noticed once that the longer the trip, the smaller amount of space my youngest has in the back seat. Everything tends to get tossed on the empty seat next to her, and soon her territory is covered with junk! Make every gas stop a mini clean up stop. Empty the garbage bowl (tip #1) and rearrange so that everyone is comfy and not covered with extra stuff! For a fun cleaning hack to keep on top of those messy crumbs, pop over to Lemon Lime Adventures. 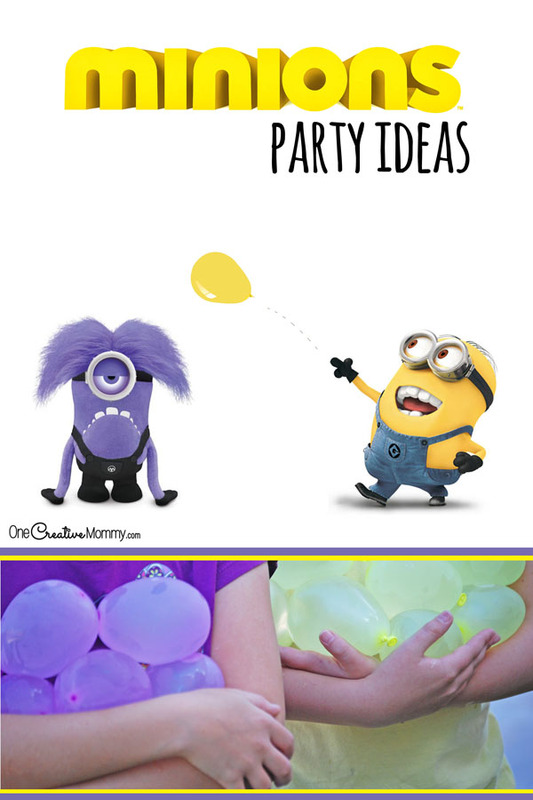 My kids are going to love this idea! 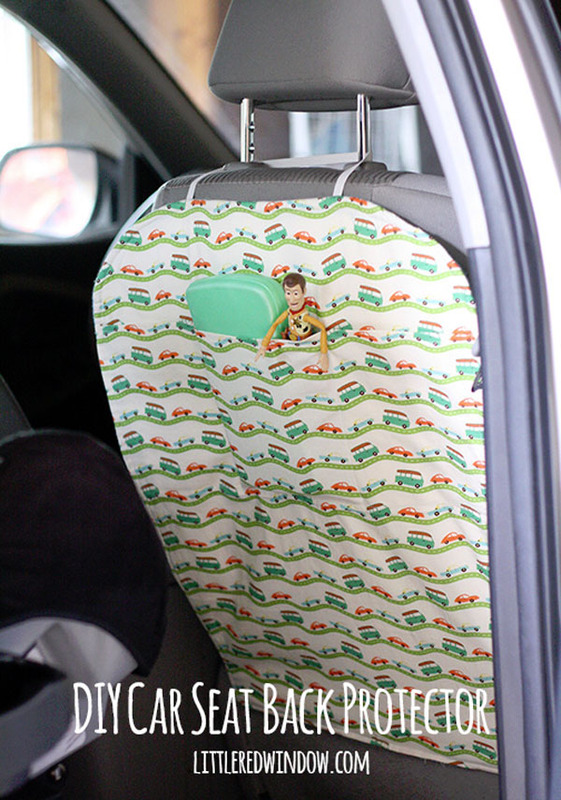 For parents with kids in car seats, check out this fun hack from Little Red Window to keep the backs of those seats clean! #6 Clean Up those Disgusting Cup Holders! I just spent ten minutes cleaning out our super disgusting cup holders. Crumbs + dirt + spilled soda = grossness (yes, I made up that word). I bet your cup holders if you looked in your cup holders right now, you’d find a similar mess. I bet if I suggested you pour a snack into your cup holder to eat on the road, you wouldn’t touch it with a ten foot pole (see Tip #2). Am I right? I’ve seen this handy tip all over pinterest, so I thought I’d give it a try. Clean out those cup holders once and for all, and fill them with silicone baking liners. (Mine are a little small because all I have right now are these cute little hearts. New ones are on my shopping list.) 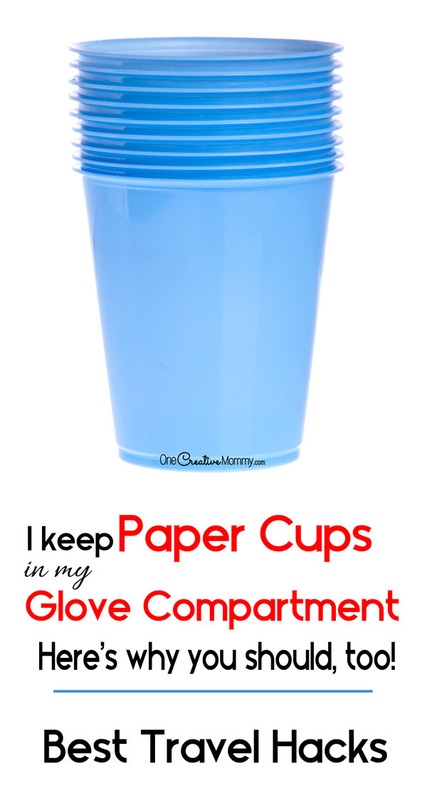 The larger ones should fill the whole cup holder, providing you with nice, sanitary storage. When they get dirty — which they will — just pull them out, give them a wash, and put them back in. Easy peasy! No more gross cup holders. You’re welcome. I still remember the favorite pair of brand new sandals I got for our family trip to Utah when I was a little girl. Even more memorable was realizing one was missing about two hours after leaving a rest stop somewhere between Michigan and our final destination. Bye bye brand new sandals. It was a sad day. 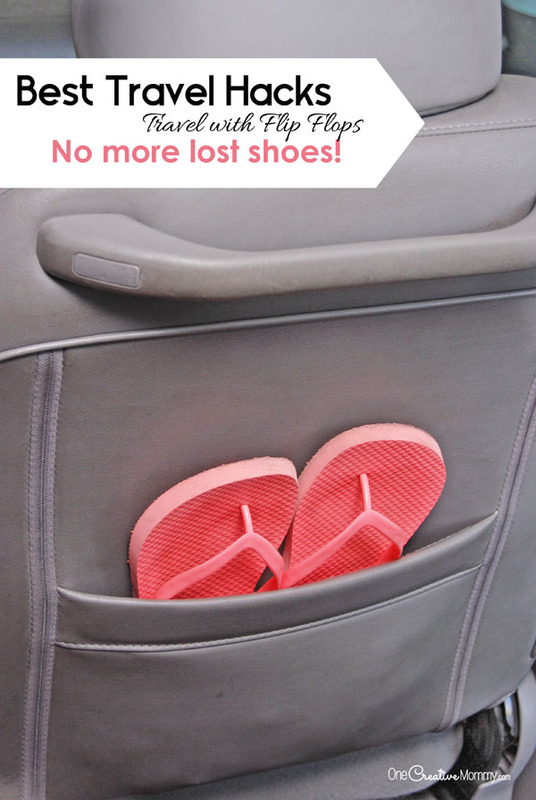 No more worries about lost shoes and slow rest stops. Travel with inexpensive flip flops. They fit easily in seat backs so they can be found quickly and slipped on when it’s time for a rest stop. Don’t pack those tennis shoes away too deeply, though. It’s still a good idea to have a good pair of shoes for everyone somewhere accessible in the car in case of emergencies. 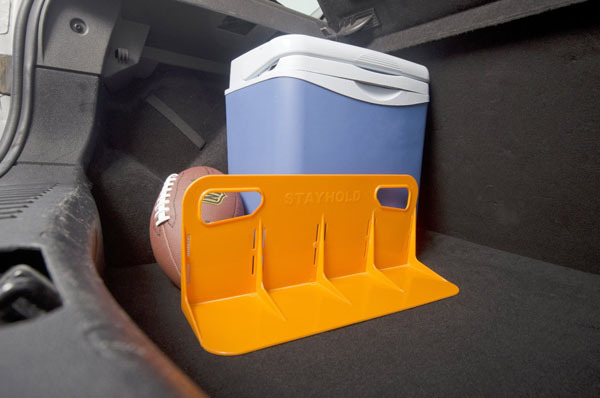 Just stash them somewhere that they won’t get accidentally knocked out of the car and forgotten. We’ve even been known to travel with flip flops in the winter! 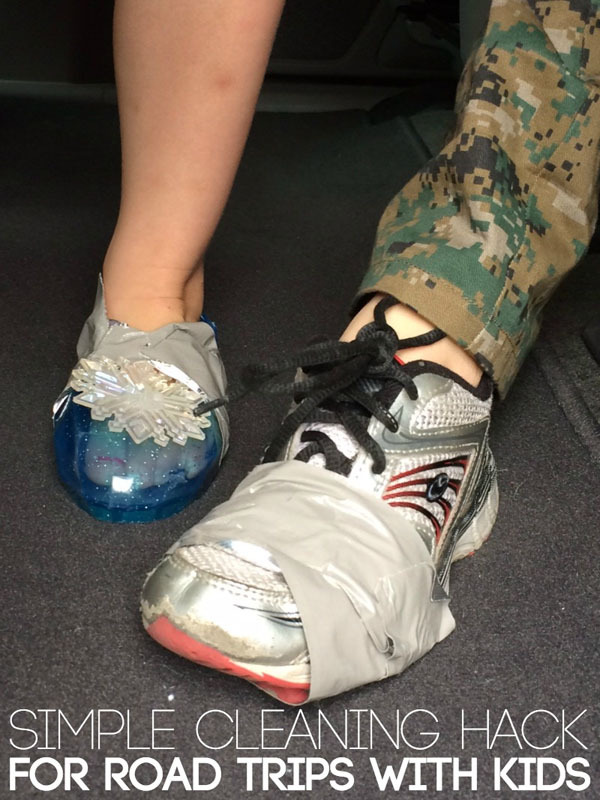 The kids wear a warm pair of socks in the car and then switch to flip flops (or leave them on — gasp — socks with sandals!) for a quick dash to the bathroom. Nobody wants to hear, “Are we there yet?” over and over. Here are a few ideas to keep the kids on track. 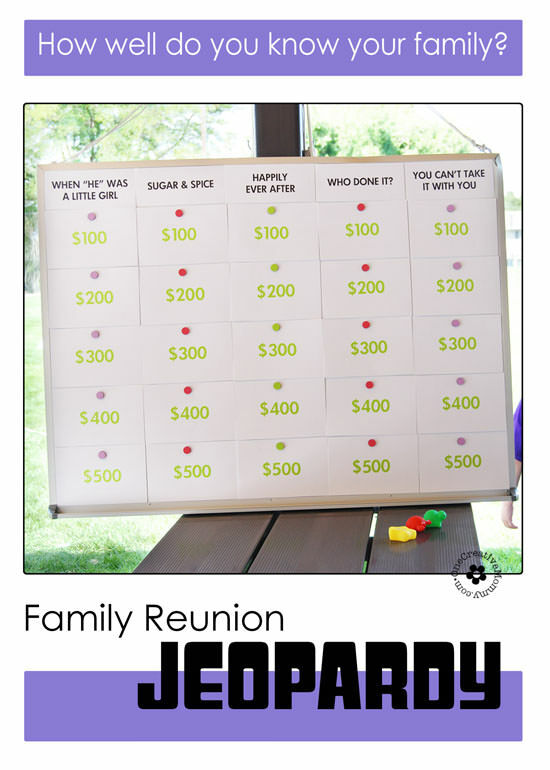 I love this Vacation Reward System from Meaningful Mama. She really knows how to keep her kids motivated while on the go! Check out East Coast Mommy’s idea for packing little gifts that the kids can open throughout the trip to mark the passage of time. Brilliant! Try these products to make listening for the whole family easier. A bluetooth speaker (if you want to listen to music or a book from your phone), headphone extension cord (so that everyone in the minivan can reach the jacks for headphones in the back seat), kid-sized headphones (the ones that came with our minivan were always too big for the kids)! While electronics are the easy route to keeping kids entertained on a trip, don’t forget old-fashioned silly family bonding fun! Take breaks from the electronics and entertain yourselves in more interactive ways, too. (Sing along to Mom and Dad’s cheesy oldies music, play the ABC game, play I Spy, pick a letter of the alphabet and see how many words you can think of that start with that letter, etc.) You can’t skip that family bonding! These hacks are so creative and simple, I kept this as a bookmark on laptop. Keeping a bowl and zip-lock bag made me giggle. It simple and useful tip and will be helpful when I will took my son for trip. He have motion sickness and keeps throwing up during the travelling. My wife also runs a Crafts blog and a regular reader of your site. She shared this with me. Thanks Heidi for sharing this stuff!! Thanks for reading, Dr. Sachin. I’m glad you enjoyed the post. These are GREAT tips! I’ve never thought of using a garbage bowl, but I do know that a garbage bag is a huge PITA. Thank you! Thanks, Jennifer, and you’re welcome. We just got back from a huge road trip, and many of these tips came in handy! These are great tips. I love the one about the cupholder! Thanks, Ellen. I love collecting great ideas and sharing them in one place. There are so many helpful tips in this post! I especially like the one about the pulley system – and the cargo holder is fantastic! Thanks, April. Isn’t that cargo holder cool? I don’t have one, but it sure would help keep all of my kids junk from rolling all over the car! Great ideas! 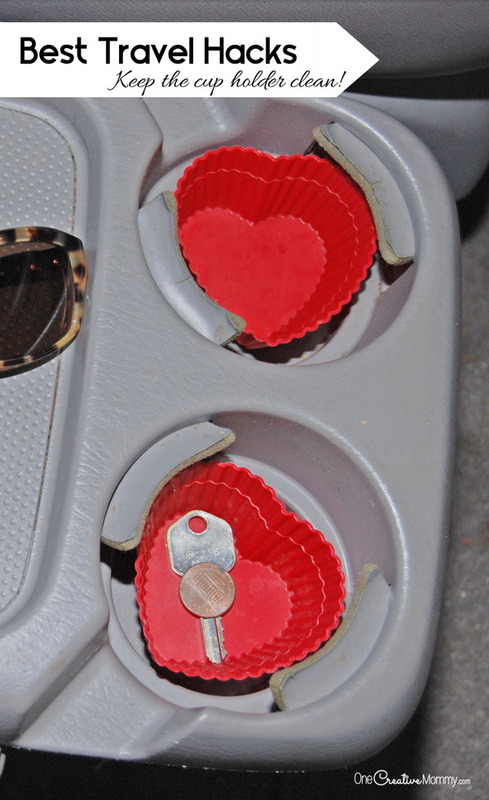 I never thought about the cupcake liner for the cupholder before, that is so smart. Those can get so gross, lol! My fiance and I like to listen to audiobooks in the car when we can, or just catch up and talk…although honestly most of the time when I’m a passenger, I’m getting work done on my laptop. LOL!! Thanks, Beeb. I once found a cookie melted and re-baked to the shape of the cup holder in our back seat. Your aren’t kidding when you say those get gross!